Welcome to Griffitts Well Packers. Griffitts Drilling & Seals is a small company, owned and operated by family, friends and neighbors. 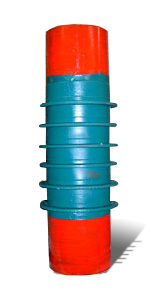 Our goal is to provide the best product that we can manufacture to stop ground water pollution. We're proud that we've been successfully meeting that goal for 45 years. Now there are several products available that claim to do the job that our seal does, but Griffitts Double Locking Well Seals are still superior for many reasons. Ours are the only packers made of a vinyl plastic sleeve permanantly bonded to the casing. Our seals are built with many applications and regions in mind, so we stock a variety of sizes on both plastic and steel casing. 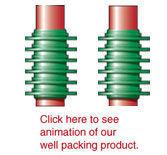 No matter which size you need, all of our well packers have multiple sealing flanges and each flange is supported by a reinforcing ring, creating more sure seal protective barriers against contaminants. Whatever way you choose to stack it, glue it, weld it or thread it, Griffitts Double Locking Well Seal was the first of its kind and continues to stand out as the best.